Exalted Orb primarily uses to add a random modifier on Rare items. One may trade Exalted Orbs to PoE currency as well. Exalted Orb is a high-value currency that can exchange to 135 Chaos Orbs. Normally, use Exalted Orb to craft high-end equipment or trade for other precious items. (6) Buy an Exalted Orb for $0.55 extra 3% off with coupon “AOE”. Trade skill gems are my favorite ways to farm Exalted Orbs. While building character, one may need specific skill gems with high level. Level up skill gems to maximum need many times. Therefore, players always purchase these gems for Exalted Orbs. (1) Find a profitable Skill Gem at https://poe.ninja/challenge/skill-gems. For example, Molten Strike of level 21 can sell 7 Exalted Orbs and Ice Nova of the maximum level for 5 Exalted Orbs. This page has listed many valuable skill gems that can trade for Exalted Orbs. (2) Buy the gem of low level from https://poe.trade/. As you can see, Molten Strike of level 1 cost an Orb of Alteration. (3) Using Gemcutter’s Prism to increase the Gem to Quality 20. (4) Equip the Gem and upgrade it automatically while playing path of exile. (5) When level up to maximum, using Vaal Orb Corrupt it. (6) Trade Gems for Exalted Orbs with other players. Level character to 35, you have a chance to farm Exalted Orbs directly. 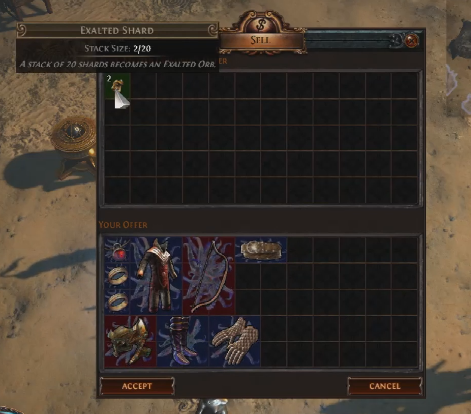 Slain more monsters, open more chests and strongboxes can increase Exalted Orb drop rate. The recipe helps you farming lots of Exalted Shards. 20 Exalted Shards will combine to form an Exalted Orb automatically. Meanwhile, these have a downgrade recipe for Exalted Orb. One can farm divination cards to obtain Exalted Orbs as well. 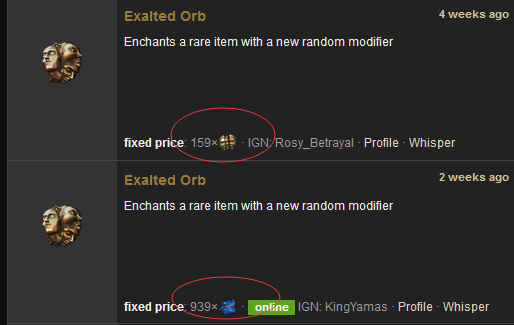 Currently, one can trade an Exalted Orbs to 160 Chaos Orbs in the player market. While farming Exalted Orbs needs many times, one can find a safe and legit site to buy exalted orbs. Aoeah offers PoE currency with awesome prices. Exalted Orb Price of Aoeah: 1.05 USD / 2.